I heard back from ARA, they posted a bulletin (Bulletin 2018-2) regarding novice drivers. Using a naturally aspirated engine I can run an engine up to 2700cc without the need of a restricter plate. The restricter plate is 55mm id for 1.5mm. There is a caveat for engines which meet these rules but also have unusually high power outputs such as the Ford Cosworth BDG, Super 2000 engines, etc. I am guessing (as I haven't asked) that the SD-4 engine would likely fit into this category. There is a chance that the SD-4 being relatively unknown outside of the S-10, Fierro, ARCA, and midget racing worlds that the technical scrutineers may not know much of the SD-4. Either way, the SD-4 will probably have too much power to drive easily as a novice. So I am definitely going to go with the EA831. I will be adding some power and reliability upgrades as this engine could use some livening up (if only to lightly tuned Porsche 924 spec). This will also make the car lighter and easier to drive. Still trying to find a HR-1 bellhousing and possible trans. Cage work will likely begin when winter is over as the car is stuck in my other (heated) garage which is snowed in. 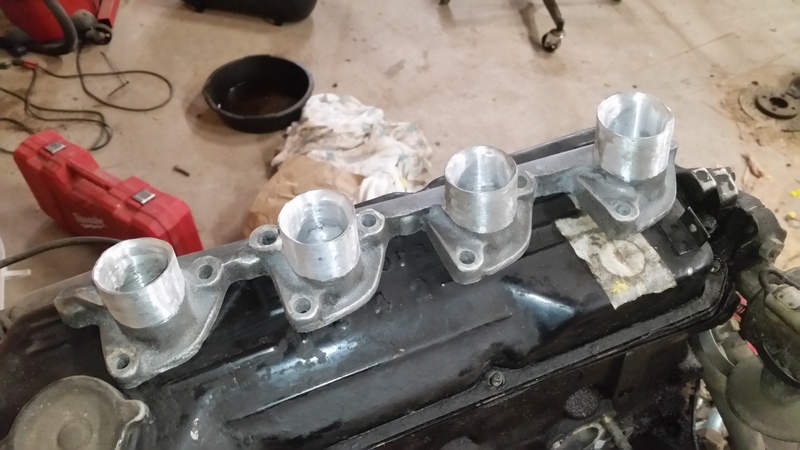 I was concerned if I bought a Porsche 924 side draft carb manifold that, since the engine sits at a different angle, that when mounted in the AMC 121 engine angle, the carbs would be slanted down and not work properly. 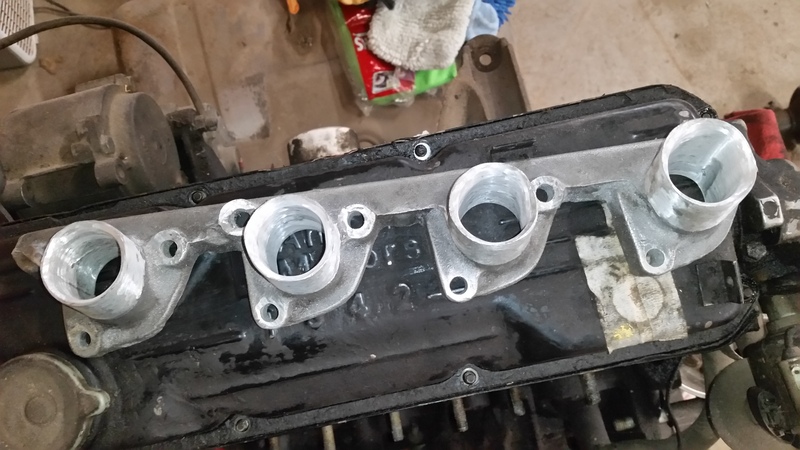 I bought a side draft intake manifold for my SD-4 engine from someone who had to build one to fit the 831 head (the head requires custom intake manifolds). He had mounted the engine side manifold to the weber side manifold using silicone tubing as the SD4 produces a lot of vibration. But this method would also work as an easy and inexpensive way of building a manifold using dissimilar metals. The way this was built gave me an idea, I could build a side draft intake manifold using the stock intake manifold. So I cut the original manifold where the tubes started to bend (so I had the maximum equal straight length possible). 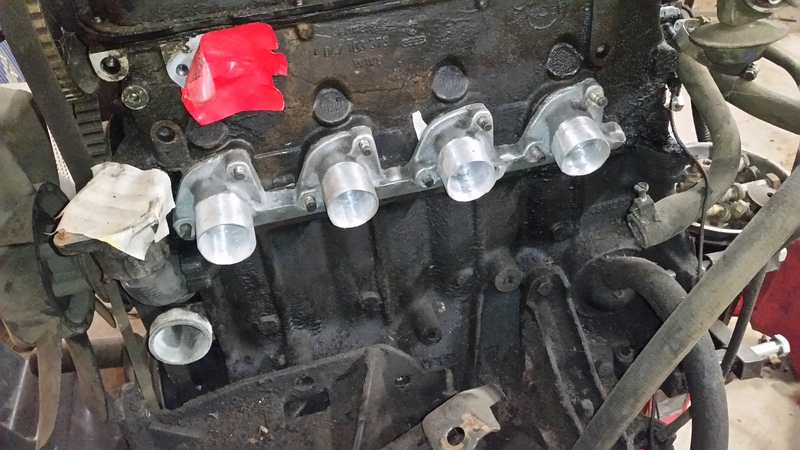 The plan is to use the stock intake manifold modified to accept short silicon tubing which can be mated to the weber DCOE manifold brackets I bought a long time ago. The silicone tubing will be relatively short to maintain as much rigidity and strength as possible and will be attached via hose clamps. The stock intake manifold is aluminum and the weber brakets are steel, so welding is out of the question and this seems more simple than brazing them together. To try to reduce the amount of air/fuel mixture interference, I ground the aluminum inlets to a more cone shape for better flow. I also gave them some light porting and some polishings to clean up the castings. Attached are some pictures of the "finished" product, just the aluminum part. The rest comes later. Nice work! I like how you are thinking this through. Sounds like a great plan to me, can't wait to see the rest of it!